Remember the Shark Bite, which added three drops of grenadine at the end to look like blood in the water? The Grim Reaper drink has a similar effect, but this time I figured out how to make it look a whole lot cooler. This delicious cocktail blends Kahlua with white rum and grenadine. The flavor is like a mix of cherry and chocolate mocha with hints of caramel. It’s fruity and rich, and most people at a party will like it. 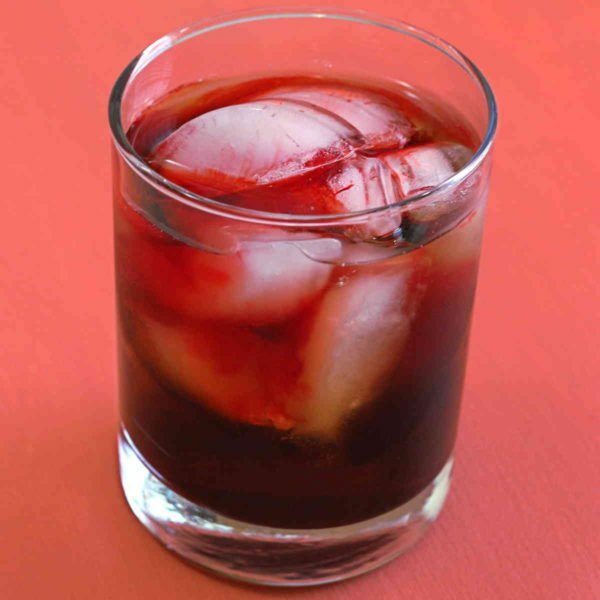 You can mix up the rum and Kahlua in advance, but you’ll always need to add the grenadine at the end. Why? Because you just want to dribble it on top, so it looks like blood floating in the drink. The only problem is… well, maybe it’s just me. Or my ice cubes. But I found the grenadine rolls off my ice so quickly it’s lost in the drink. I’ve tried this many times, and I just can’t get it to work. Maybe it’s my lack of skills. Maybe it only works with certain shapes of ice cubes. All I know is, it’s really frustrating. So here’s what I do: I add the dash of grenadine for flavor, and then I drop just a couple of drops of red food coloring onto the ice. That stuff sticks to the ice very well for several minutes and creates a stringy effect that kind of looks like bloodshot eyeballs. Yes, it’s a cheat. I admit it. But when presentation matters, I’m not above a little cheating. This drink is obviously a great choice for Halloween or a spooky movie night. It’s also fun anytime you want to impress your friends with something that’s kind of gross but really cool. Because it’s sweet and fruity, this drink is terrific served with snacks like popcorn or bacon crackers. If you want to enjoy it with a meal, then I would think of it as something like a cherry cola. Anything that goes with cherry coke should go well with this drink. Try pairing it with a copycat In-and-Out burger or a turkey club sandwich.